George Lamson and Linda Cashion live with their two golden retreivers, Calla and Maggie, full time in Serene Lakes. 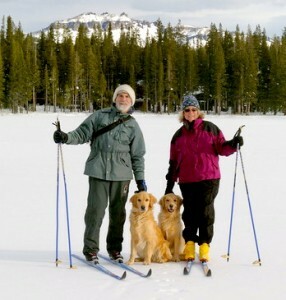 They have been part or full time residents of the Donner Summit area for 12 years and have explored the area extensively. Both are avid outdoors people and enjoy hiking, biking, kayaking, offroading, skiing (xcountry and downhill) and traveling. Their daughter Amanda and son Brian grew up enjoying the area. Both George and Linda are retired scientists from the biotechnology industry. George is a serious photographer and has photographed the summit area extensively. His work can be viewed at his Zenfolio site and is also displayed in Google Maps.